Jewish Lights Publishing, 9781683366737, 304pp. Fully revised with a new author's preface, epilogue, and over a dozen new guided exercises, Anne Brener brings us an innovative integration of Jewish tradition and modern professional resources in this 25th anniversary edition of a modern classic. 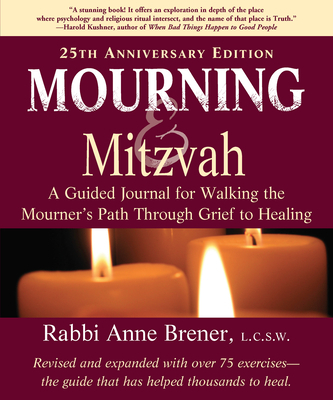 Mourning & Mitzvah gives spiritual insight and healing wisdom to those who mourn a death, to those who would help them, and to those who face a loss of any kind Mourning & Mitzvah teaches you the power and strength available to you in the fully experienced mourning process. When the temple stood in the ancient city of Jerusalem, mourners walked through the gates and into the courtyard along a specifically designated mourner's path. As they walked, they came face to face with all the other members of the community, who greeted them with the ancestor of the blessing, "May God comfort you among the mourners of Zion and Jerusalem." In this way, the community embraced those suffering bereavement, yet allowed for unique experiences of grief. Rabbi Anne Brener, LCSW, is a psychotherapist, spiritual director, and frequent "scholar-in-residence" across the United States and internationally. Her work focuses particularly on the issues of grief, mourning, spirituality and healing, She works with congregations to help create caring communities, lectures on the therapeutic impact of Jewish ritual and practice, and leads workshops that explore the connection between spirituality and psychology. In her private psychotherapy and spiritual direction practice, she works with both individuals and groups. A founder of one of California's first shelters for victims of Domestic Violence, she has worked as a Hospice Chaplain and co-founded a training program for Jewish Spiritual Directors. Currently, she is Professor of Ritual and Spiritual Development at the Academy for Jewish Religion, California. Anne's work is enriched by her own experiences with loss and personal growth, her belief in the healing power of ritual, and her professional skills in psychotherapy, communications, and community organization. Ordained a rabbi in 2008 by Hebrew Union College-Jewish Institute of Religion, Los Angeles, she holds graduate degrees in the fields of Communications, Social Work, Jewish Communal Service, and Hebrew Letters. Anne grew up in New Orleans and currently lives in Los Angeles.